STEPS TO A PERFECT CUSTOM FIT - Use the sizing chart to pick the right size for your pet: small, medium, large or extra-large. Extend the harness to the maximum size on both ends and then slip it on to your pet. Now you can see if it fits snug to their chest as it should. If it's too loose, simply pull it tighter. The adjustment stays in place without slipping so there is no need to do this again unless you have a puppy that is still growing. Easy on / easy off for dogs of all sizes. 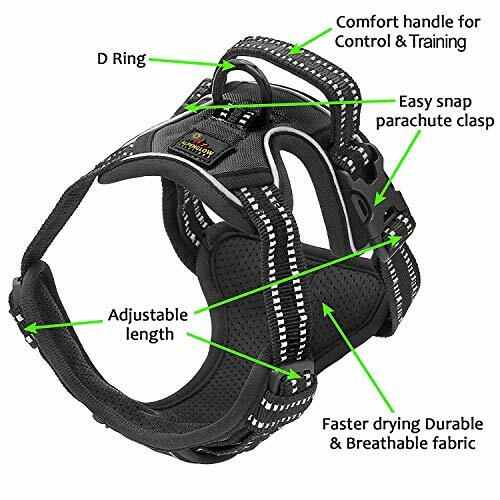 NO PULL DOG HARNESS - No more pulling or choking with the even distribution of pressure using our dog harness. Not only does it go around their neck like a collar, but is also secured around their chest so your dog is more comfortable and you're able to control them much easier. 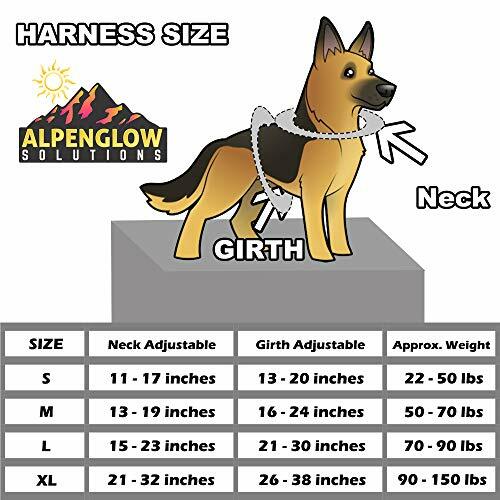 These harnesses are great for large dogs and extra-large dogs that tend to walk their owners instead of the other way around. We use soft, padded, breathable material to make it comfortable for your furry friend. 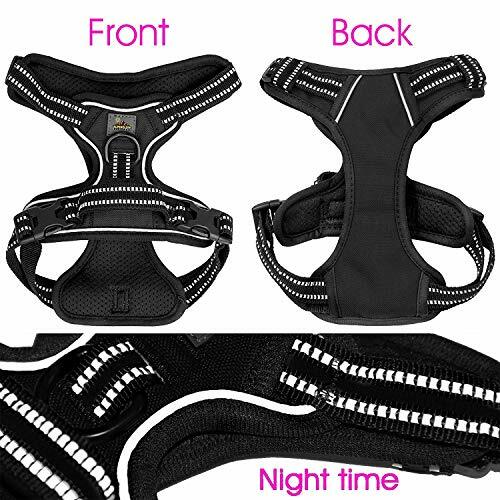 REFLECTIVE STRAPS - Nighttime walks are safe with the reflective straps that are all over the harness. Used as a dog safety vest at night, cars' headlights reflect brightly off this tactical dog harness that is virtually escape proof. A brand new Dog Harness would make a great gift or stocking stuffer for the Holidays or your Pet's birthday! 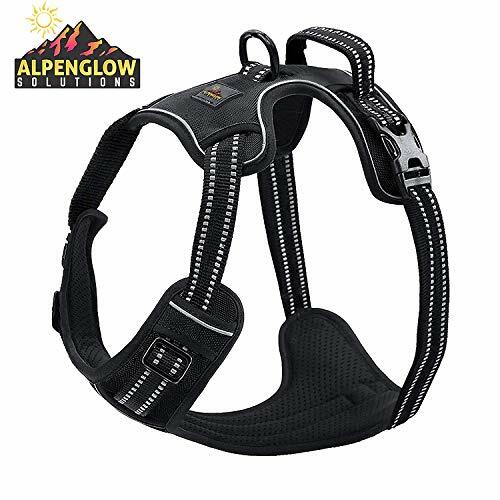 HIGH QUALITY - High quality, durable materials, and construction with a sturdy metal leash attachment D-ring and a heavy-duty handle on top of the harness. This dog harness handle allows for full control when you need it, especially with large breed dogs. Additionally, the handle helps when assisting your dog into your vehicle or when they need a gentle lead into somewhere they may need help. GUARANTEED! 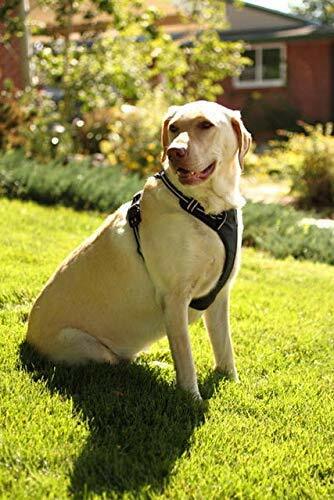 We are so sure that you and your dogs are going to love this harness that we offer a 90-day money back guarantee in case you do not love our harness as much as we do. 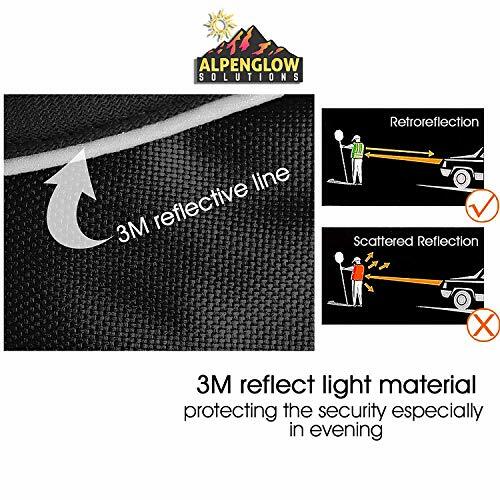 No risk for you when ordering from a company you can trust, ALPENGLOW! Grab one of these fashionable dog vest harnesses.